We’ve all heard the phrase. We all understand there’s truth to it. But ask yourself: would you recommend or hire everyone you know? No way. Having the right connections is important to advancing your career. But it’s only half the battle. What really creates opportunity is defining your personal brand to your employer, to your network, to the market. It’s taking that moment when you make a great impression and scaling it to the larger world. This guide presents different approaches real professionals are using to build their brands. 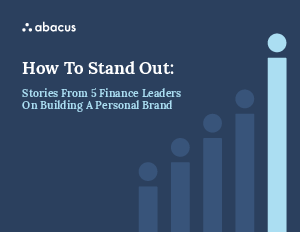 You’ll see tips and strategies that you can use to become an in-demand finance leader, including a system we developed called the ROLE Model of personal branding. In the age of effortless connection, cultivating a personal brand is essential. It’s not just who you know. It’s what they know you can do.